A NASCAR Camping World West Series race at Portland International Raceway ended Sunday and Hershel McGriff still hasn’t pressed the brake pedal. “It’s been crazy,” McGriff said Wednesday. “One interview after another. I was on NASCAR Now on Tuesday and then I did an interview with Fox. I was on ESPN First Take earlier (Wednesday) and I’ll be doing something with a Florida radio station later on. A BBC reporter even called me from London on Monday. At age 81 – no, not a misprint – McGriff became the oldest driver to compete in a NASCAR car, resetting a record he already held when he last competed in what was then called a Winston West Series race seven years ago at California Speedway. And this was no typical senior citizen on a Sunday drive. McGriff, who still holds several records in the West Series circuit, started last and one lap down in a field of 26 due to an equipment change. He finished 13th but was on the lead lap of a 66-lap road course race. McGriff not only opened his own eyes with the performance, he caught the attention of many others. McGriff, who has 20-20 vision and exercises regularly, always has been one to march to his own drum beat, admitting he turned down a 1955 invitation by NASCAR founder Bill France to drive a Chrysler at Daytona Beach, Fla.
McGriff chose to spend most of his career in the West Series (No. 3 all-time with 35 career wins), but still made 85 career Cup Series starts and won four races, all in the 1954 season when he finished sixth in the national championship standings. McGriff made his final Cup start in a race at Sonoma, Calif., in 1993, when he was 65. His last victory made him NASCAR’s oldest winner when he won in 1989 (61 years, 4 months) in a West Series race in Bakersfield, Calif. So what enticed stock car racing’s Old Man River to dust off the racing suit and helmet for another poke at racing glory? “Everyone pretty much has been asking the same thing,” said McGriff, who moved from Oregon to Green Valley, Ariz., near Tucson about 25 years ago. “My answer is, ‘Why not?’ I’ve never got racing out of my blood. But I knew when I stopped racing seven years ago that I’d come back one day, I told some people that when I’m 80, I think I’ll run a race or two. McGriff instead chose to scrub the mothballs from the stock car he last drove seven years ago and embark on a three-race schedule (all road courses) beginning with a race last month at Infineon Raceway in Sonoma. Sherrie McGriff, who married Hershel 12 years ago, knew better than to raise an objecting hand. She chose the latter and her husband chose to move onto the next step, which meant reaching into the checkbook to help underwrite the endeavor. McGriff, however, also received sponsorship help from Park Corporation, a mining company he has worked for the past 54 years. Throw in pit crew help from son Hershel McGriff Jr.; son-in-law Chuck Bown, a former West Series champion; another relative who works for Red Bull Racing on the Cup circuit; and other family and friends, and the elder McGriff was off to the races. McGriff, however, had a momentary hiccup by failing to qualify at Infineon, making the Portland stop his comeback race. McGriff’s final race is scheduled Aug. 1 in Tooele, Utah. “The car wasn’t right and we just didn’t have any time to test before California,” McGriff said. “But I was happy with how I did at Portland. We still didn’t have the chassis right and I had the problem with the carburetor that made us have to start a lap down. What McGriff hasn’t figured out is why all the national attention after receiving virtually none when he left the sport in 2002? What is for certain is McGriff’s intention to give the circuit’s other drivers a run for their money. But even if McGriff doesn’t fare as well as hoped, what’s next? Is there a 2010 season in McGriff’s calendar? “I absolutely have no plans for next year,” McGriff said. “But I ride a bike (five miles) most every day, I do Pilates, my wife makes sure I eat right and I have a Total Gym in the house. Hershel did an interview with Fox which is scheduled to air this Friday, the 24th of July at 4:30 pm pacific time. It is to air on the show, “America’s Nightly Scoreboard” on the Fox Business channel. That was no misprint in Monday’s results. Yes, Hershel McGriff, the Hershel McGriff, finished 13th in the Camping World West Series race Sunday in Portland. The 81-year-old Hershel McGriff. “There were a lot of other cars out there that were a lot slower,” said race winner Jim Inglebright. “He did a great job.” As he has for six decades. It’s not very often a member of the Hall of Fame is in the field with current competitors. But if there’s anyone capable of doing it, it’s certainly Hershel McGriff. Hershel McGriff has been racing since the fifties, winning four NASCAR Cup races in 1954, and doing a few stints at Le Mans as well. In 2002, McGriff set a record for being the most chronologically advanced driver to run in a NASCAR-sanctioned event. Last weekend, he broke his own record. Piloting a 2003 DEI Chevy, McGriff ran in the Camping West World Series at Portland International Raceway and came in 13th out of 28 drivers. And that’s after starting at the back of the pack and a lap down because of a carburetor change after qualifying. Said McGriff: “I did not want to go out there and flop around.” Mission accomplished, Mr. McGriff… and well done at that. If he gets his way, he’ll break his record again at the race in Tooele, Utah on August 1. This week, the 50-and-over set can walk around with a little pep in their giddyup and with heads held high after a weekend when “seasoned” athletes proved that age is nothing but a number. Also on Sunday, Hershel McGriff finished 13th out of 26 drivers in a road course race at Portland, Ore., International Raceway, part of the NASCAR Camping World West Series. That’s not bad, considering he had to start at the back of the pack and one lap down because he replaced the carburetor after the qualifying session. But it’s downright awesome when you consider the fact that four of his NASCAR Cup series victories came in the 1954 season. The 81-year-old has 37 wins in the West series, was named one of NASCAR’s 50 greatest drivers and was inducted into the Motorsports Hall of Fame in 2006. McGriff, who broke his own record as NASCAR’s oldest driver, last raced in 2002, but entered three events this summer. He did not qualify for a June 20 race at Sonoma, Calif., He is expected to try and qualify again for an Aug. 1 race in Tooele, Utah. McGriff drove in his first race in the family sedan on a dirt track at Portland Speedway in 1945 at age 17. The next year there, with the track newly paved, he won his first race. These athletes, along with veteran athletes of years past, such as Satchel Paige, George Blanda, Gordie Howe, Kareem Abdul-Jabbar, Bill Shoemaker, Nolan Ryan, Martina Navratilova, George Foreman and Dara Torres prove that it’s neither the years nor the miles. If you’ve got it, you’ve got it. So the next time the youngsters in sports give you a hard time for knowing where you were when Lincoln was assassinated, you tell them old fogeys can still get it done in the field of athletics. That will teach those young whippersnappers to keep their pie holes shut. Move over, Tom Watson. Hershel McGriff, at 81 years of age, finished 13th in this past weekend’s NASCAR Camping World West race at Portland International Raceway. We’ve all heard about that, right? But did you realize when and where he made his first career NASCAR start? The inaugural Southern 500 at Darlington. No joke. The inaugural Southern 500. And he finished ninth. Let that sink in for a minute, would ya? Then go back and read some of the articles written about McGriff in your spare time. He’s truly a living link to those “good ol’ days” we all wax poetic about around here. The 1986 Winston West champion (it was known as the NASCAR Pacific Coast Late Model Series when he started, back in the 1950s), winner of 37 races on that circuit in 234 starts spanning 34 years, McGriff has truly seen it all. He made 85 Grand National/Cup starts, too, going to Victory Lane four times — all in 1954. McGriff made 24 of those 85 starts that season and finished sixth in the standings. Throughout the rest of his career, he’d pop in for two, three, or four starts per season, mainly when the circuit visited Riverside or another western facility. Choosing to stay racing on the Winston West circuit, he was successful enough to be named as one of NASCAR’s 50 Greatest Drivers in 1998. That a driver who competed in the inaugural Southern 500 could suit up today and run 13th in a sanctioned NASCAR race just amazes me to no end. Hell, that an 81-year-old still has the fire in his belly to jump in one of today’s stock cars and go toe-to-toe with a bunch of 20- and 30-somethings amazes me. Mr. McGriff, you haven’t lost a thing. Here’s to hoping you have a couple more races in ya. 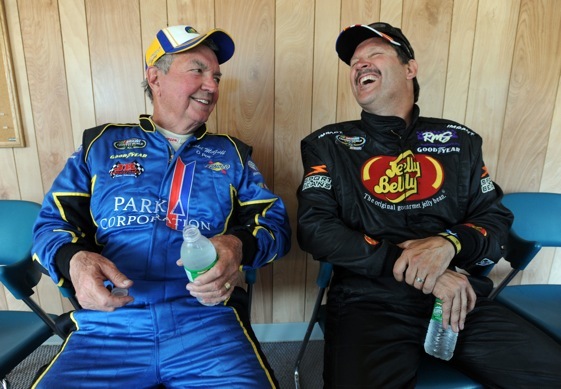 When he took the green flag at Portland International Raceway on Sunday, 81-year-old Hershel McGriff became the oldest driver to compete in a NASCAR event (at the national or regional level). Since Sunday, he could also be considered the busiest driver in NASCAR. Hershel has been swamped with interview requests from media outlets across the country. He even responded to a request for an interview from the BBC World Service in London, England. Everybody wants to talk to Hershel. It’s been great to watch his interviews – and there have been many of them, including ESPN2’s “NASCAR Now” and “First Take.” Hershel has always had an appreciation for the media. And they seem to appreciate him. Pressed about his secret for staying so young, Hershel says he has tried to stay as active as possible and take good care of himself. Well, it appears to be working. He is sharp mentally and physically. He serves as an inspiration that just because you reach retirement age does not mean you have to be headed for a rocking chair. Next up for Hershel is the third road course event of the season for the NASCAR Camping World Series West – at Miller Motorsports Park in Tooele, Utah on Aug. 1. More racing and already more media requests. Life never slows down for Hershel McGriff. PORTLAND, OR - JULY 19: Hershel McGriff works his way through the Chicane during the NASCAR Camping World Series West BI-MART Salute to the Troops 125 at Portland International Raceway on July 19, 2009 in Portland, Oregon. McGriff placed 13th in the race and became the oldest driver to drive in a NASCAR regional or national event.